Morakot (Emerald), 2007. Video installation: memories and dreams in a disused hotel in Bangkok. Thai filmmaker Apichatpong Weerasethakul has a Degree in Architecture from Thailand and a Masters in Fine Arts in Filmmaking from Chicago. His interests lie in space and the built environment and in art film. About his films, he says, "It’s as simple as showing the places I like, the people I admire, the landscape, architecture, sound. This is the root of filmmaking". These ideas may appear straightforward, but it is the creative translation of these concepts by Weerasethakul, using material and sensibilities from his home country, that has given a new spin to interpreting space and stories through image and sound. In so doing, his work appears sometimes as installations as he ponders the space in which the videos are screened. 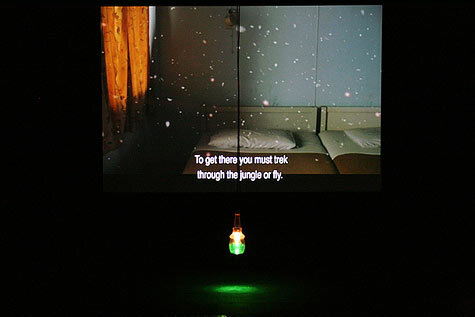 The artist has chosen to show Morakot (Emerald, 2007), in response to the theme of Wonder in the Biennale. The ‘Emerald’ is a disused hotel in Bangkok, which opened its doors in the 1980s when Thailand was going through social change and an accelerated economy. Things changed with the Asian economic crisis in the late 1990s. As he was researching rooms for another shoot, the experience of being in the now empty spaces, with motes lingering in the air made an impact, perhaps like a star first bursting into life then later slowly disappearing. He returned to the hotel a year later, re-engaging with this experience together with his actors as they recounted their own memories and dreams to make <iphasize>Morakot</iphasize>. Weerasethakul has been courageous in breaking out a different aesthetic in his films. Much of their character not only comes from the specificity of the spaces of Thailand, but also of what is deemed ‘beautiful’ there and in the Indo-Chinese region. The filmic presence of Weerasethakul’s films is fresh, raw and lively, yet quite beautiful. For example, the computer graphics applied to Morakot have seen previous incarnations as dust particles or floating feathers, but are in fact culturally re-framed and appear different and suitably wondrous. The deliberate and intelligent use of these particularities of cultural ‘seeing’ and perception in his work have allowed his films to stand out and win major international awards, including those at the film festivals of Cannes, Venice, Tokyo Filmex and many more. Visual artist, lives in Singapore and Australia, exhibiting internationally (including several Biennales, and Documenta). Co-curator of the 2nd Singapore Biennale 2008. 11 September - 16 November 2008. Theme: Wonder. Artistic director: Fumio Nanjo. Curators: Joselina Cruz, Matthew Ngui.